I am the proud owner of three dogs, but my favorite of them all is, without a doubt, my German Shepherd, Kona. She is almost two years old and is still a complete ball of energy, but that is part of what makes her so great. She never runs out of the desire to play, learn, and please her owners. I've owned many dogs throughout the years and I have never owned any dogs that compare to the German Shepherd's ability and desire to please their owners and learn new behaviors and skills. When Kona was a small puppy, I was able to house train her in a matter of days (much faster than all our other dogs), teach all basic obedience within a month and we have since moved on much further from that. Kona actively competes in the dog sport of Schutzhund. In case you don't know, Schutzhund is an intense working dog sport that combines the disciplines of tracking, protection, and obedience work. Kona excels mainly in the area of tracking, although she performs quite well in the other two areas also. She is also a well trained bird dog who will both flush and retrieve. Nothing is more enjoyable that watching her goofy grin as she drops pheasants and ducks at your feet all fall long. She is a handy dog to have around in a place where hunting is a primary activity each year. 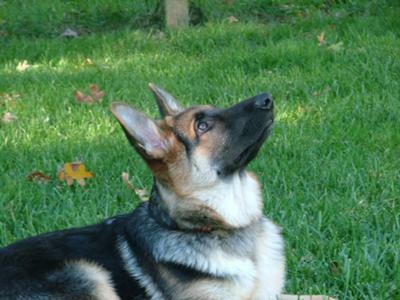 German Shepherds also have a reputation for being great protectors of their family and that couldn't be truer. My German Shepherd would do anything to protect her family and property and I never fear going out for walks at night with her by my side. She alerts us to any and all activity in the neighborhood (be it suspicious or not) and gives us the head's up anytime someone approaches the house. This dog has swayed my decision to only ever own German Shepherds for the rest of my life. I love my others dogs, but they are my pets and companions, Kona actually works.